It may not look too different, but the 2019 Subaru Forester is all-new, with better handling, reduced road noise, an impressive amount of standard features and an almost ironically-named new Sport trim that altogether almost make up for its desperately slow acceleration. But there’s still plenty on offer if you’re okay with not being a speed freak. The 2019 Forester is the fifth-generation of Subaru’s compact crossover SUV thing, with this generation feeling a lot more like an SUV in the best ways. While it doesn’t look very different from the outgoing model, the new Forester sits on a new global platform and gets a new Sport trim and a bunch of little quality touches that deliver a lot of improvement. And the new, relatively-minor shift in styling makes sense if you look at Subaru’s numbers, as it claims the fourth generation doubled sales for the model and became one of the brand’s hottest sellers. Don’t fix what isn’t broken, and all of that. 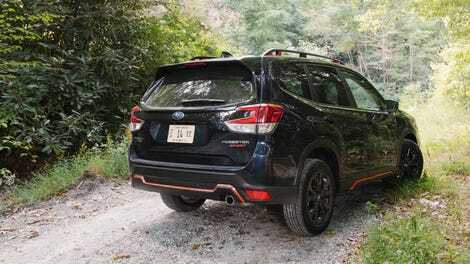 If you’re curious about whether the Forester is right for you, Subaru claims 47 percent of Forester owners go hiking, 45 percent own a dog, and 19 percent are on at least their third Subaru. If that’s you, stop reading here and call in to your local dealer. Just get it over with. One of the biggest changes include the use of the new global platform, a scaled-down version of what’s riding under the new seven-seater, 19-cupholder Ascent. Subaru claims the platform makes the car a lot stiffer and a lot quieter driving down the road. That, coupled with an 7 percent increase in steel in the structure should make the ride safer too. The other big change also boosts safety, as Subaru’s EyeSight driver assistance technology is now standard on all trim levels of the new Forester. The system is camera based, as opposed to radar based systems found on some other cars, and provides standard active cruise control, forward collision warning and brake assist, and lane-keep assist all as standard. It sits mounted inside the top of the windshield in a cute little robot-looking package. And you can also turn all the stuff off, if you want. Other little improvements include remote start, automatic locking (yes, this is just now a standard feature on the Forester), Apple CarPlay and Android Auto are now standard, and some extra shoulder space and cargo room gets added, thanks to that new platform. While that’s all well and good for the majority of the people who will buy these, many of you readers will be disappointed to hear that the manual transmission option is gone for good (because only 3 percent of buyers optioned it, you losers! ), leaving the CVT automatic as the only choice. On top of that, the only engine that Subaru wanted to talk about is the heavily revised 2.5 liter four-cylinder Boxer. It only offers up to 182 horsepower, and while it feels hardworking, it’s pretty slow. Completely new to the Forester lineup for 2019 is the “Sport” trim. It’s the punched up dark blue model with black and orange detailing you’ve seen in the photos above, and it slots right into the middle of the trim lineup. Despite the Sport name, it doesn’t get any more power than the rest of the lineup, at least for now, and is still only available with the CVT automatic transmission. What is unique about it is a bespoke sport drive mode setting, which tries to make the engine work a little harder to get the power down quicker, and which offers a seven-speed manual mode with steering wheel paddle buttons that tries to convince you the CVT isn’t a CVT. The Sport also offers a second X-Drive off-roading mode tuned for wetter, muddier situations. On the road, the Sport suffers from the same lacking acceleration and performance as the rest of the lineup, even in its Sport Sharp mode, but does wake things up to sound and drive just a touch sharper. It definitely benefits from the improved handling of the new platform, which uses the brakes to employ a torque vectoring system that works really well withe the standard all-wheel drive. It was enough to feel fun to drive on the tighter Blue Ridge Mountain roads. If I was going for one of these new Foresters, I’d have a hard time passing the Sport trim up. I love the dark blue color of the test car we shared around, and the orange accents inside and out, which show up on the bumper, roof rails, side and rear guards, interior air vents, stitching, and gear selectors, all makes for the most aggressive and best-looking trim option, and edges the Forester further away from your standard crossover look. While not exactly the sportiest of things, the three different trims I did get to check out all made good on Subaru’s claims of a quieter and smoother ride. As I said, the cornering is confident and even sort of fun, and if you’re carrying any hard-earned momentum from managing to actually get the thing up to speed, it can handle it. I did get to do a little off-roading, which essentially boiled down to fooling around on the hill behind a giant random mansion, and the conditions were dry so we only tested the standard X-Mode. What’s great about X-Mode is that it can be just a one button affair. You push down on the selector and you’re ready to go. Subaru had us test the hill descent control on what I think they claimed was something like a 27-degree slope, I took my foot off the brake and it performed as advertised. I also want to repeat how smooth this thing feels driving down the road, only undercut by the exhausting way you have to try to keep your speed up when looking to have fun. On a bumpy gravel road, the suspension ate just about everything up, and for the entire trip I never felt like I was even close to losing traction. Inside, you’re seated in a comfortably tall position and it feels like there is a ton of space, and most of the contact surfaces are padded enough to avoid feeling cheap. The screen apps available on the optional 8-inch infotainment setup were easy to use, and while touch-response wasn’t instant, it was nowhere near frustrating. The Forester is definitely something that’d be easy to live with day to day. On that note, some of the interior touches do feel a little on the cheaper side in typical Subaru fashion, like the wiggly, unimaginative plastic buttons under the infotainment screen, and even on the top Touring model, I was still facing awkward hard plastic button-delete inserts. It didn’t help that most of the climate control and screen controls were draped in smear-prone plastic piano black trimming, which has become the bane of my existence. I can’t understand why seemingly every automaker has made it their go-to trim choice. Other notes on the interior include the sheer amount of buttons. While I firmly believe physical buttons and controls are ideal, having a button for every single possible screen-switching, radio control, active cruise control and safety system gets a little overwhelming. As I said with the standard EyeSight system, you can turn everything off, but I can’t see a lot of reason why most people would. The buttons could have easily been relocated into the screen settings. Tucked on the underside of the steering wheel is more buttons dedicated to the second screen that sits above the main high on the dashboard. They’re a little awkward to use and only switch through what shows up on this little screen, displaying stuff like real-time wheel traction and descent angle and stuff, which is great for the passenger to enjoy but virtually ignored by a driver doing their job. I didn’t see a lot of point to it. Beyond those nitpicks, I wasn’t in love with how some of the Forester trims looked. While the Sport looked a little aggressive and rugged, the lighter color and chrome accents of the Premium and Touring models I drove made the vehicle seem torn between a crossover and SUV, and not in a good way. It’s not really bad, I just found that outside of the Sport model, the trims have a really hard time standing out from one another, despite some major price differences. The Forester’s biggest offense, though, is just how slow it is. It barely feels tuned to even satisfy a standard highway on-ramp test, and struggles to get to highway speeds. The Boxer has to work way too hard to get power and torque in when it counts, and it’d be nice if Subaru could work out a way to get it even marginally quicker when taking off. 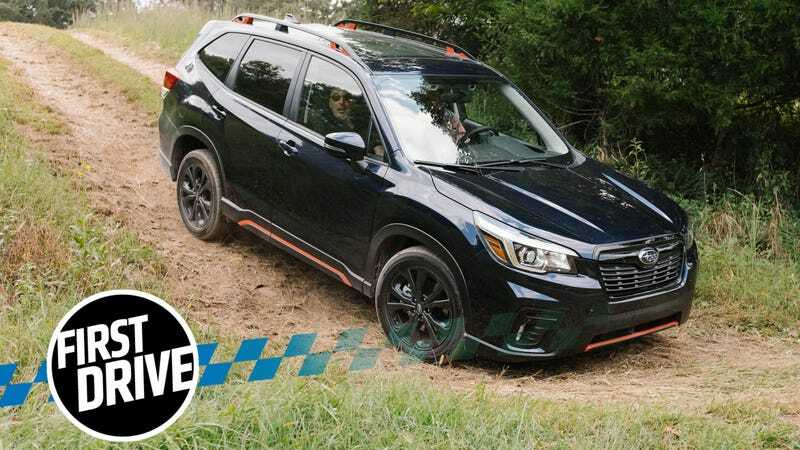 Ultimately, the 2019 Subaru Forester is a solid, comfortable, capable and affordable little AWD SUV. I like how it rides, and I’m glad it looks a little tougher. Subaru sells a ton of these, and there’s no reason the trend won’t continue here. While I wish it could be quicker, Subaru knows it’s selling as many of these as it can build, and its focus on pushing more standard safety equipment shows it probably knows better than me and is focused on what counts. Still, a turbo would go a long way in making this thing damn near untouchable as an fun, affordable little weekend off-roader. The ride is smooth and the standard equipment is nice, but you're going to struggle even passing on the highway. This thing isn't going anywhere quick, but it rides nice, handles well, and comes equipped with idiot-proof AWD.